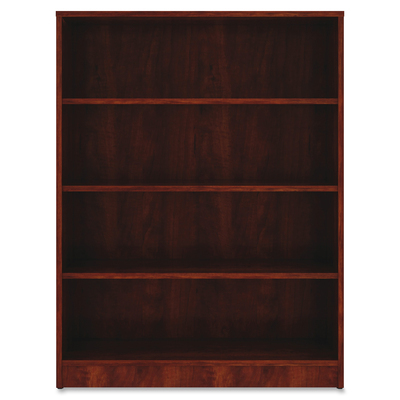 Sturdy, Four-Shelf Bookcase Offers High-Quality Laminate Construction And A Contemporary Design. Shelves Are 3/4" Thick And Made Of 18mm Thick, Medium-Density Fiberboard With Thermally Fused, Cherry Laminate For Long-Lasting Use. The Visible, One-Piece Backing Behind The Shelves Is Made With 3mm Thick, Medium-Density Fiberboard And Matching Laminate. Both Sides Are Finished. Bookcase Features Three Adjustable Shelves, One Fixed Bottom Shelf, Square Edges And Adjustable Feet. Each Shelf Holds Up To 75 Lb..
Sturdy, Four-Shelf Bookcase Offers High-Quality Laminate Construction And A Contemporary Design. Shelves Are 3/4" Thick And Made Of 18mm Thick, Medium-Density Fiberboard With Thermally Fused, Cherry Laminate For Long-Lasting Use. The Visible, One-Piece Backing Behind The Shelves Is Made With 3mm Thick, Medium-Density Fiberboard And Matching Laminate. Both Sides Are Finished. Bookcase Features Three Adjustable Shelves, One Fixed Bottom Shelf, Square Edges And Adjustable Feet. Each Shelf Holds Up To 75 Lb.